Lime Crime Haul, and something happened. Each Velvetines are $20.00 USD and after discount, approximately each Velvetines I pay around $14.00+. The shipping from USA to Malaysia is $10.95 USD, took about 4 weeks to arrive and I think my order does not exceed RM500 in the receipt so I did not get tax charges. 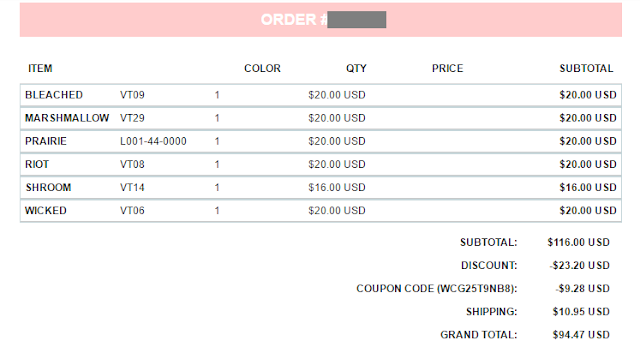 In the receipt the -$23.20 is the 20% Flash Sale discount and the $9.28 discount I forgot where I got it, I think its from the mailing list or first time order code. Sorry, I try to remember but I could not! So each Velvetines are around RM55+. So after 4 weeks plus my package arrive, with their signature super gorgeous mailer box. The shade I bought are Shroom, Wicked, Riot, Marshmallow, Prairie and Bleached. All comes in the metallic box and the frosted tube with flowers print on the cap. Super pretty! But I notice that the cap have different shade soft red. Theres goes my OCD. Here are the swatches. So this happen. I notice that the formulation has change. From what I remember, the Velvetines I tried before has a creamy and super pigmented formula. Dries instantly but still very2 comfortable on the lips. I notice that these Velvetines are now very liquidy and streaky. Dries slow on the lips and does feels sticky on the lips. Some of the like, in the shade Wicked and Riot are pretty good, lightweight but dried to matte after a few 1 minutes+. Shades such as Bleached, Marshmallow Praire are streaky and does not dries to matte completely. It was a bummer actually bit still they are workable and looks pretty on my vanity haha. Lime Crime Velvetines swatch, From left to Right : SHROOM, WICKED, RIOT, MARSHMALLOW, PRAIRIE, BLEACHED. Also this happens, I did not know that they are very liquidy so I accidentally spill it all over my newly washed bed sheet (cries at the corner). What do you think? Maybe because of the Flash Slae I got a bad batch or something? Does the formula really change? I saw their Instagram feed, the colors are not like what I have here. I am not in their drama, I know some of you boycott them because of the drama but I did wanna get my self into it. Oh well, this is what you get for the price I pay right! But still, I love them and will try to make it work since I bought it with my own hard earn money. Haha! You can purchase them at www.limecrime.com , they ship internationally!